Confronting the need for revolutionary education that directly engages the most pressing issues facing our world, the Ste(A)m Village positions itself as a aggregative education facility that can deploy to any site and adapt to the specific conditions and challenges of that context. Taking cue from the growing fields of tomorrow, the proposed classrooms of the Ste(A)m Village break from the traditional heuristic approach of English, Maths, Science, etc. and instead address issues of Food Shortage, Water Conservancy, Material Sciences and Creative Re-Use, Electrical Engineering and Computer Science, and Renewable Energy Production. Each of these subjects is tied to a specific structure whose form and fixtures mirror the structure's use and spatial needs. Recognizing that each of the disciplinary assignments are not all-encompassing, the Ste(A)m Village takes advantage of its campus format, programming the intermediate functions between the classrooms with uses that address the critical overlaps between fields. Through this intermediate programming, the multidisciplinary collaborative potential of the Ste(A)m Village emerges in its aggregation, yielding a space whose educational potential exponentially increases with client investment. The presented proposed heuristic structure of the Ste(A)m Village was carefully programmed to be of maximum relevance to the needs of its sample client, the Ellis School, an all-girls K-12 school in Pittsburgh, PA whose educational mission is to equip its graduates to be able to critically engage the future issues and needs of the world. The Ellis School collaborated on the project with discussion and critique on the school's needs and curricular focuses. 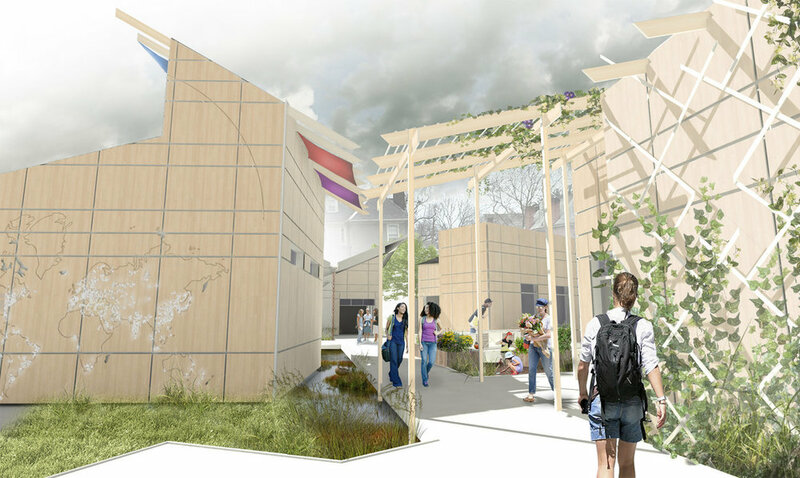 Beyond Ellis, the modular nature of the Ste(A)m Village gives it the potential to deploy its program and curriculum to the spatial conditions and academic needs of other educational and cultural institutions.